Aging creating loose skin and stretched and loose ligaments and muscles (senile entropion). An eye infection called trachoma is still common in North Africa and South Asia and this can cause scarring of the inner eyelid, which may cause friction and entropion. Treatment is a relatively simple surgery in which excess skin of the outer lids is removed or tendons and muscles are shortened with one or two stitches. General anesthesia is sometimes used before local anesthetics are injected into the muscles around the eye. Prognosis is excellent if surgery is performed before the cornea is damaged. Entropion has been documented in most dog breeds, although there are some breeds (particularly purebreds) that are more commonly affected than others. These include the Akita, Pug, Chow Chow, Shar Pei, St. Bernard, Cocker Spaniel, Boxer, English Springer Spaniel, Welsh Springer Spaniel, Labrador Retriever, Cavalier King Charles Spaniel, Neapolitan Mastiff, Bull Mastiff, Great Dane, Irish Setter, Shiba Inu, Rottweiler, Poodle and particularly Bloodhound. The condition is usually present by six months of age. If left untreated, the condition can cause such trauma to the eye that it will require removal. Entropion has also been seen in cat breeds. Typically it is secondary to trauma, or infection leading to chronic eyelid changes. It is also seen secondary to enophthalmos. Congenital cases are also seen with the brachicephalic breeds being over represented. Upper lid entropion involves the eyelashes rubbing on the eye, but the lower lid usually has no eyelashes, so little or no hair rubs on the eye. Surgical correction is used in more severe cases. A number of techniques for surgical correction exist. 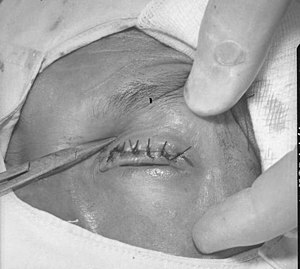 The Hotz-Celsus technique involves the removal of strip of skin and orbicularis oculi muscle parallel to the affected portion of the lid and then the skin is sutured. 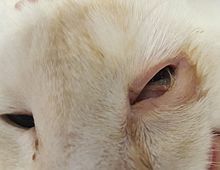 Alternative techniques such as the Wyman technique focus on tightening the lower eyelid, this technique is not as effective in cases of enophthalmos.Shar Peis, who often are affected as young as two or three weeks old, respond well to temporary eyelid tacking. The entropion is often corrected after three to four weeks, and the sutures are removed. ^ Rabiu M, Alhassan MB, Ejere HO, Evans JR (2012). "Environmental sanitary interventions for preventing active trachoma". Cochrane Database Syst Rev. 2: CD004003. doi:10.1002/14651858.CD004003.PUB4. PMC 4422499. PMID 22336798. ^ a b Gelatt, Kirk N., ed. (1999). Veterinary Ophthalmology (3rd ed.). Lippincott, Williams & Wilkins. ISBN 0-683-30076-8. ^ "Blind dog Lily and faithful chum Maddison seek new home". BBC News. 21 October 2011. ^ Williams, DL; Kim (Jul–Aug 2009). "Feline entropion: a case series of 50 affected animals (2003-2008)". Veterinary Ophthalmology. 12 (4): 221–226. doi:10.1111/j.1463-5224.2009.00705.x. PMID 19604337. ^ Bojrab, M Joseph (1998). Current techniques in small animal surgery. Williams & Wilkins. ISBN 0-683-00890-0.